Deepening Anti-Islamic Mood In Texas Rivals Post-Sept. 11 Climate After Paris and San Bernardino, reports of Islamophobia and attacks on mosques are on the rise, especially in the Dallas-Forth Worth area. One Muslim activist calls 2015 "a banner year for hatred." Nearly 1,000 protesters gather in January across the street from the Curtis Culwell Center in Garland, Texas, where a Muslim conference against hate and terrorism was scheduled to be held. "I can show up and protest unarmed and be a sitting duck for the next pair of ISIS members that decide to come along and blow our heads off like they did in California — or I can show up there prepared to defend myself," Wright says in a telephone interview. He declined to give his age, profession or where he lives, fearing harassment. In September, Irving made national news when police arrested a 14-year-old boy, Ahmed Mohamed, for bringing a homemade clock to his high school; authorities said it looked like a bomb. 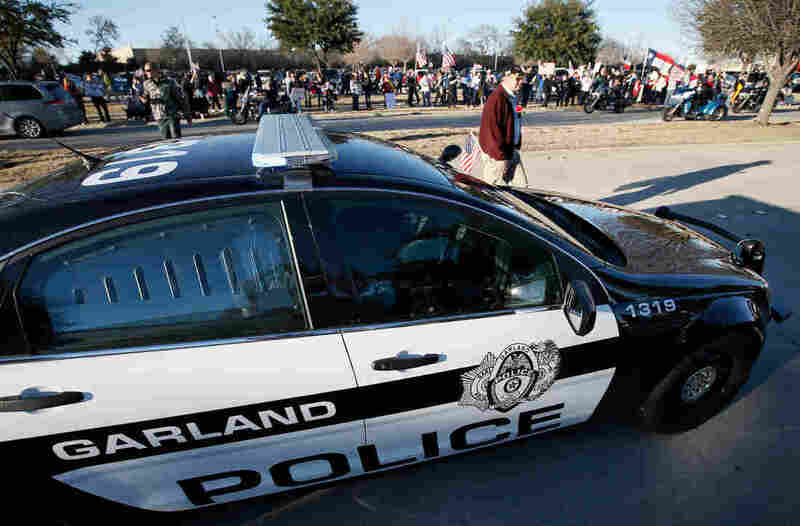 Elsewhere north of the city, police killed two Islamic extremist gunmen in Garland in May outside a meeting where people had gathered to see cartoons mocking the Prophet Muhammad, and in Richardson, north of Dallas, there was another armed protest at a mosque in October. 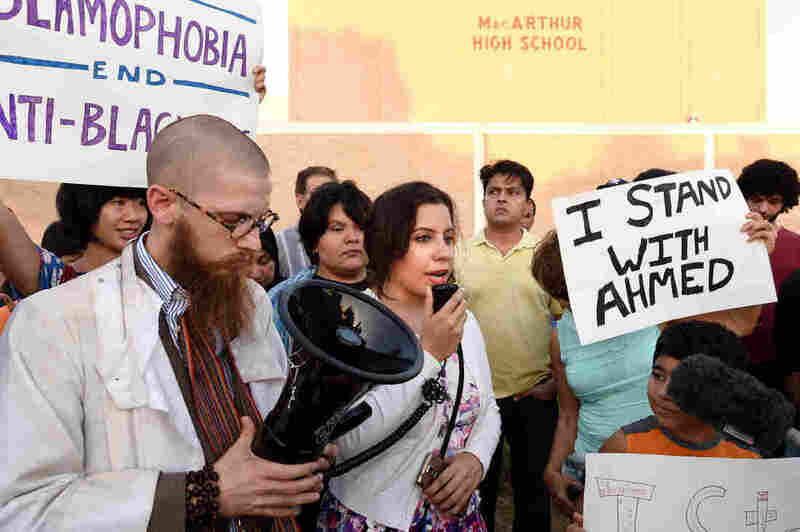 "2015 was a banner year for hatred in the Dallas-Fort Worth metroplex, but it was centered in Irving," says Alia Salem, director of the DFW chapter of the Council on American-Islamic Relations, or CAIR, a Muslim advocacy group. "On the one hand, we have to try to maintain good relationships with everyone, and to show the Islamic hospitality and good manners," he says. "But when you have these kinds of rallies and protests on your doorstep it becomes difficult to do that." The large and thriving Muslim population in the Dallas area lives and works in an environment that's growing more hostile toward their religion. Note a recent sermon delivered by the Rev. Robert Jeffress — pastor of First Baptist Church of Dallas, one of the largest, most influential members of the Southern Baptist Convention — on the Sunday after the ISIS attacks in Paris. "Make no mistake about it," he said from the pulpit in downtown Dallas, "Islam is just not another way to approach God. Islam is a false religion and it is inspired by Satan himself." Many folks date the anti-Islam mood around the region to an Irving City Council meeting last March. By a narrow margin, the council passed a resolution that Muslim critics claimed was hostile to their religion, and supporters insisted was merely patriotic. The council voted to support a state law that would have told mosque authorities their religious tribunals must conform to U.S. laws. Imams pushed back that they never intended to impose sharia, or Islamic law, on their congregations. The bill never made it out of committee in the state capitol. Irving Mayor Beth Van Duyne has gone on the conservative media circuit to defend her city. "Anybody who thinks that being pro-American equates to being Islamophobe says a lot more about that person than it does about the council supporting American laws and American courts," she said in a brief interview after a luncheon in Dallas last week. With domestic terrorism seemingly on the rise, suspicion of American Muslims is certain to increase. Former Irving Mayor Marvin Randle says he doesn't think his community is out of the main. "We don't think just because Muslims are here they're terrorists," he says from his office in his countertop company. "But what we read in the paper about the Muslims over in Paris and all these things makes you a little bit jittery. You still have a little question mark about it." Salem, director of the local CAIR chapter, says when Klansmen of the Texas Rebel Knights announced they were coming to Irving, that was the tipping point. She says in the past week, dozens of churches, synagogues and other sympathizers have contacted her to stand in solidarity with Muslims in North Texas. That will be on display this Saturday when two dueling demonstrations are planned outside Dallas-area mosques — one for and one against Islam.